The Immigrant Kids Have Health Issues — But Not The Ones You'd Think : Goats and Soda Some politicians say that the nearly 60,000 unaccompanied minors who've come to the U.S. could put the nation at risk for everything from TB to mumps. Health officials tell a different story. 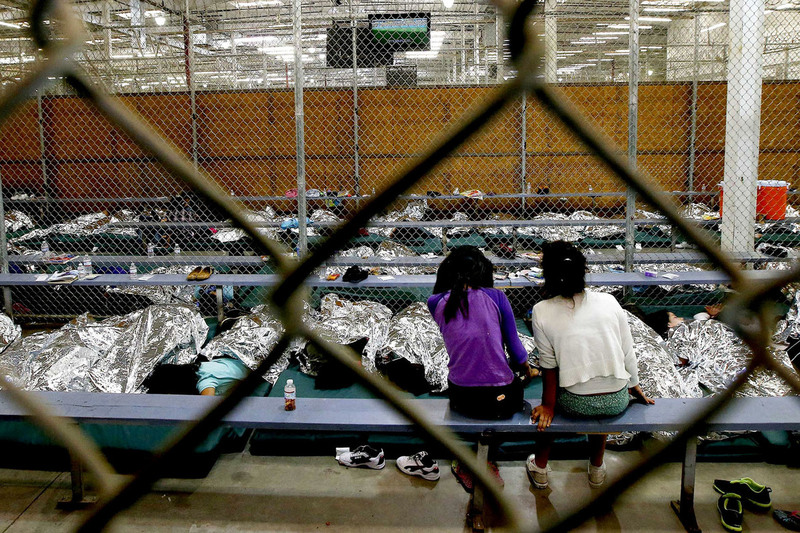 Two young girls, part of the wave of unaccompanied children who've illegally entered the U.S., watch a soccer match at the Customs and Border Protection Nogales Placement Center in Arizona. Close to 60,000 children have crossed illegally into the U.S. since last October. They've sparked a crisis. But is it a humanitarian crisis or a public health one? Dengue Fever 101: How Serious Is This Disease? The children carry "swine flu, dengue fever, Ebola virus, and tuberculosis," and can spread the diseases to the U.S., wrote Rep. Phil Gingrey, R-Ga., a retired obstetrician-gynecologist, in a July 7 letter to the Centers for Disease Control and Prevention. Gingrey's concerns have been widely circulated as part of a public campaign by folks who share his view that the kids should be sent back. And some of the points he's raised have been widely rebuffed. The current Ebola outbreak has been confined to Africa, as have past outbreaks. And neither dengue nor the "kissing bug" disease known as Chagas, which was brought up by others, spread from human to human. Transmission involves bugs and dogs. But some health issues in this contentious debate require closer examination. There have, for example, been a handful of reported cases of TB among the children. And concerns that the children may not have been vaccinated — or may harbor scabies and lice — aren't as absurd as the Ebola claims. A TB epidemic is perhaps one of the biggest concerns, since the U.S. doesn't vaccinate against the disease. The fear of a fatal respiratory disease that attacks the lungs and can spread through the air is understandable. But it's worth keeping in mind that in 2012, the average coverage for TB vaccine in Central America was 93 percent, the World Health Organization reports. And the facts on the ground do not back up such worries. All children who arrive at a border station are screened for TB with skin tests and chest X-rays; those infected are immediately isolated and treated. So far this year, only three TB cases among unaccompanied children have been reported by federal officials to the Texas Department of State Health Services, says spokeswoman Carrie Williams, and only one case in Arizona, according to a report by Pima County Health Director Francisco Garcia. Such low numbers are not cause for alarm, given that Arizona already sees about 200 cases of TB a year, and Texas sees nearly 1,300. What about the possibility that the children could spread measles and mumps? Gingrey wrote that many children come from countries that lack basic vaccinations, which would pose a risk to unvaccinated Americans. The general public may well believe that vaccines are hard to come by in low- and middle-income countries, but that's not always the case. "The primary care system in developing countries is more effective than in the U.S. — better than people think," says Irwin Redlener, a pediatrician at Columbia University and co-founder of the Children's Health Fund, which provides health care to the disadvantaged. Indeed, in Honduras, Guatemala and El Salvador, where roughly 80 percent of the children have come from, immunization for measles has 93 percent coverage, according to WHO. To be on the safe side, all children are vaccinated during their short stay at processing facilities in Texas and Arizona. That happens at least three days before they're sent to different shelters around the country, says Kenneth Wolfe, a spokesman for the U.S. Department of Health and Human Services, in an email. "Like any shelter system, when you have a group of people or children living [together], there's always theoretical risk of spreading diseases," says pediatrician Alan Shapiro, who co-founded an immigrant youth clinic in New York, called Terra Firma. But those risks, he adds, usually remain within the shelter and won't spread to the community as long as good primary care is provided. Since October, Shapiro's clinic has provided physical and mental health care to nearly 50 unaccompanied children now living with a family or sponsor. He says there's no need to worry about a spread of contagious diseases. "The children that I see for the most part have a good experience in the shelter," he says. "The facilities have been more than adequate, and they are seen by medical personnel and getting vaccines." Some kids have even brought immunization records from their home countries, he says. At the processing centers, vaccinations are updated — everything from measles, mumps and rubella to tetanus, whooping cough and polio. As a cautionary measure, all detainees are evaluated right at the border to stop any potential disease from spreading as early as possible. They're screened at least once — first by a member of the Border Patrol and then by physicians, if necessary — for signs of any disease. This includes rash, fever, persistent coughing, vomiting and diarrhea, says Jessica Maxwell, a spokeswoman for the Department of Homeland Security, which works with Border Patrol. The incidence of infectious diseases is very low, she says. The more common issues are related to traveling: dehydration, heat exhaustion, foot and ankle injuries, lice and scabies, which are treatable. Children who have medical problems may be transferred to a hospital for treatment. Aside from the TB cases, there have been three flu cases and a few gastrointestinal and respiratory issues at the McAllen Processing Center in Texas, says Williams. Of the 4,000 unaccompanied minors processed in Nogales Processing Center in Arizona, there were two flu cases and two chicken pox cases, reports Garcia, who noted that the risk of spread beyond the shelters is low. That's not to say there are no health issues among the kids; it's just that none poses a threat to the public. The centers haven't been perfect. Texas health officials who visited the McAllen facility two months ago reported overcrowding as well as a lack of full medical scans and hand-washing stations. But Williams says better care is now being provided, partly because fewer immigrants are arriving. Meanwhile, the "fear mongering," as Shapiro calls it, takes attention away from the bigger issue at hand: mental health. "These are children who are coming over to escape the violence that absolutely pervades the community [back home]," he says. During their journey they are at risk for abuse by Mexican gangs. In the U.S., they must adjust to a new environment and unfamiliar faces. "There's such incredible amount of change that these children have to go through during a relatively short period of time," he says. "The amount of trauma or stress cannot be understated."